“Democracy must be learned by each generation.” These few words were so important to Clement A. (Pete) Duran, an Albany New York YMCA Boys’ Work Secretary, that in 1936 in New York State, he initiated the first Youth and Government Program. After meeting Duran at a national YMCA conference and hearing of the Youth and Government work being carried on in New York, T. Douglas Monahan, then on the staff of the Illinois State YMCA invited Duran to Illinois to meet with YMCA personnel who were becoming very excited about the possibility of Youth and Government in Illinois. Thus, in early 1949, Pete Duran, known as “the Colonel” to many, came to Illinois at Monahan’s request. In preparation for Duran’s visit, Monahan had already put into place the leadership relationship which is at the heart of the YMCA movement — that being the partnership between the YMCA professional and dedicated laymen. Monahan the Y professional, sought Dr. Frank Endicott, Professor of Education and Director of Placement at Northwestern University to become the first Chair of the Youth and Government Program. 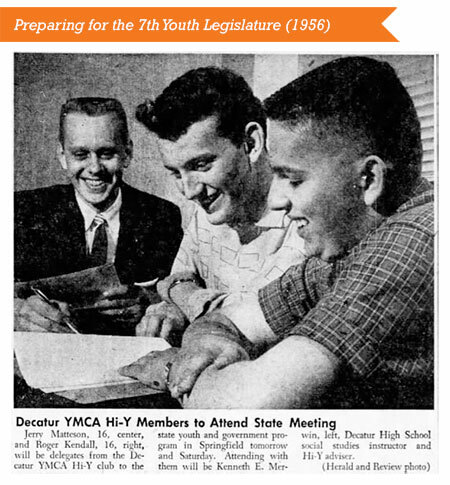 And thus, it was these two, Douglas Monahan and Dr. Frank Endicott who met with Colonel Duran and set Illinois YMCA Youth and Government into motion. Both men relate, however, that it was actually the dedication and cooperation of one other person who allowed their dream to become reality. Illinois Governor Adalai Stevenson proved to be their greatest ally and advocate. When Monahan and Endicott met with Stevenson in Springfield with their rather revolutionary proposal of teens taking over the state Capitol, they were overwhelmed with the support and assistance offered by the Governor. Stevenson in turn rallied all of the support needed from other state officials to put the program in place, and the first Assembly was held on April 24-25 1950 in Springfield. As a result, Youth and Government has enjoyed the support of every Illinois Governor since that time.